I’m one of those people who loves “holiday spam” photos flooding my Instagram and Facebook feed. I’m intrinsically nosey and I want to know all the things. I want to know where people are heading to, what they’re seeing, what they’re eating, where to do the best shopping, where they pour the best cocktails and how good the spa is. Yes, NOSEY. And shallow in my travel pursuits. Those images will spur me on to save and book for a new holiday or, if I’ve got an escape already booked, research more about that particular holiday. This year we’re heading to Hawaii to celebrate the eldest kid’s 21st birthday … a long way for a party, yes, but it seemed like a whacky-but-fun-idea for someone born on the Fourth of July. I see it playing out a little like the Modern Family Hawaii episode (watch this space). Anyhoo, it seems I’m not alone in this holiday planning situation. I’ve started to receive the annual influx of reader questions, asking about what to pack for a holiday in (insert destination) in (insert season). So, I thought it would be a good idea to group together some of the most popular what to pack for a holiday posts that have previously featured on Styling You. When you’re backtracking through the posts linked below, don’t skip the comments section. So many Styling You readers have added in their advice as well. Gold. 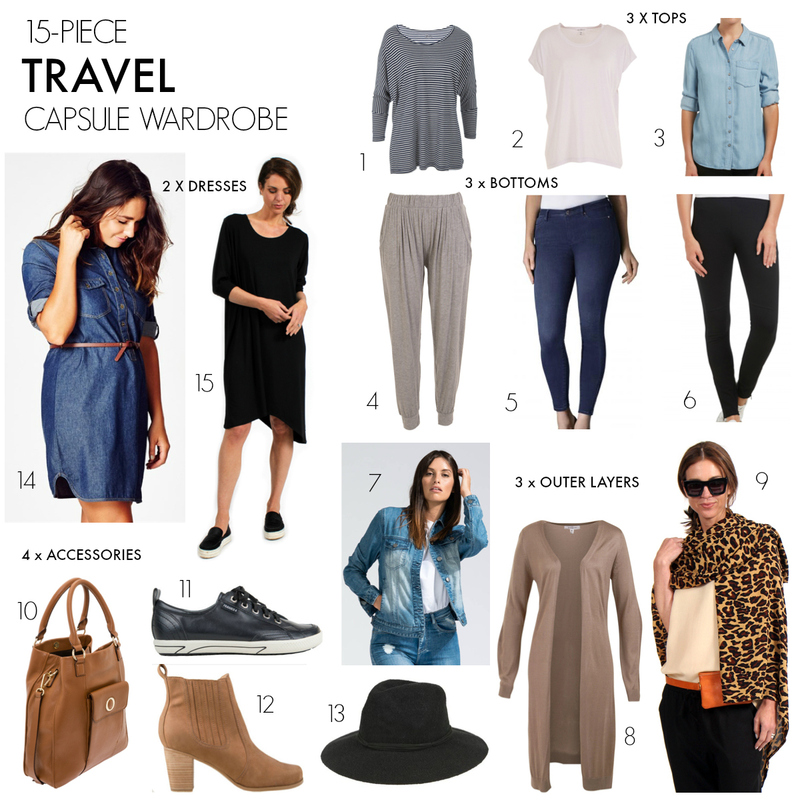 And because you love a capsule wardrobe as much as I do, I’ve put together a 15-piece travel capsule wardrobe that is largely trans-seasonal. These capsules are meant as planning thought-starters, for you to build upon to suit your holiday destination and season. Just add or subtract layers, switch out boots for sandals, felt hat for straw and add in a swimsuit or coat, depending on the season. 9 tips for packing clothes for a trip away: These are the same principles that I use for all my packing endeavours – whether for an overnight work trip or overseas for three weeks. What to pack for a European summer holiday: If you want to make your travel wardrobe packing a science, I can suggest you blog about what you’re packing, as you pack it. Just laying out all the clothes I’d set aside for this trip made me re-evaluate and cut back on what I was taking. The end result was that I did use all that I packed … except my activewear. I did enough walking sightseeing and was comfortable in my FRANKiE4s that I didn’t pull it out once. What to pack for Europe in spring: This post was prompted by three Styling You readers travelling to Europe last spring. There’s a definite need for warmer clothes if travelling before summer hits. What to pack for Hawaii: these tips will help you pack for a resort holiday where the temperatures are pretty constant throughout the stay and the emphasis is on the beach, day trips and relaxed evenings out. Beauty travel essentials: this is one area of my travel packing that I’m still working on minimising but this post breaks down how I went about that for our holiday in Europe last year, including my in-flight beauty essentials. How to pack a hat for travel: This is a packing hack that I’ve implemented twice and each time, I’ve opened my suitcase at the destination holding my breath. But it works. Try it – much better than lugging on a long-haul flight and risking in the overhead compartment. What to pack for a health retreat holiday: Activewear, activewear and more activewear. At least I was being active in my activewear. What to pack for a cruise holiday: I’m no cruising expert but I did pick up some tips on a sampler cruise last year. What to pack for a weekend in Melbourne: Escaping for a fun weekend away with your partner or girlfriend/s is always a good idea. These tips are aimed at a winter trip away and are especially useful if you live somewhere warm and don’t regularly dress for the cold. What to pack for a tropical weekend away: This post will help you if you’re doing the opposite of a winter-destination escape. Tropical is all about light layers, flat sandals and a touch of glam. What to pack for a weekend conference: Heading to a conference where you don’t know many people can be daunting. If you get the “what to wear” question covered off then you’ll have a tonne more confidence to meet others and make new connections. What to pack and wear on a road trip: not all holidays involve flying. A good Aussie road trip is always a good idea for exploring new places or visiting friends … without as tight a luggage restriction. I share my five style tips for a no-fuss, yet stylish road trip wardrobe. How to pack for a long weekend: some times it’s the short breaks that can be the most tricky to pack for. This post will help you piece a travel capsule together for changeable weather. Travel Style – Pinterest: Here you’ll find some inspiration and links to clever people who can do three weeks of travel with just carry-on on (I salute you!). Now, I’d love you to play a little game in the comments. Answering these questions will be a huge help others escaping this year and looking for tips about what to pack for a holiday. 1. If you travelled last year (near or far), where did you go? 2. What time of year was it? 3. What were the top 5 things you’re glad you packed for that destination and season? 4. Are you planning a trip this year. What packing advice are you looking for? I missed this post Nikki, you’re headed to Hawaii this year, my ALL TIME fave destination! Make sure you check out Chuck’s Steakhouse in Waikiki for dinner at sunset (good food, good value, good for the family and GREAT view of Diamond Head.) Mai tais at the Moana Surfrider Beach Bar are an absolute must (also better at sunset.) And an insider tip for you – the Sephora at Ala Moana is generally better stocked than the one in Waikiki but they’re both very good. Scarf that doubles as a wrap as it rained in Slovenia. Although I would not recommend travelling in the middle of summer, it’s too hot. 47 degrees in Bosnia and walking around sightseeing was unpleasant. 4. Are you planning a trip this year.What packing advice are you looking for? I’m heading to Tasmania for 8 days over Easter. It will be quite cool according to the Elders weather app and I have carry on luggage only so advice on strict downsizing! This becomes difficult with bulkier clothing needed for the cooler temperatures. My travel bag is always half full of things I’m happy to leave behind so that there is room for the local threads that I like to buy while I’m away. Generally I leave things for hotel staff, especially in countries where people are less well off than I am. My last holiday was in Cuba this time twelve months ago. The “pack to leave behind” idea works well there because material goods are hard to come by in Cuba and people appreciate little gifts like t-shirts and dresses. The weather is hot and humid so loose cotton dresses and light cardigans (as protection from the sun) are ideal. The item I was most grateful for though was my comfortable Ziera shoes. Finding a coat to take with me when I travel is always a dilemma. I’d love some advice on how to find a coat that’s warm, waterproof, and virtually weightless. Thanks. I have just discovered Bared footwear online and in Melbourne. Most comfortable stylish shoes ever! Ive bought three pairs for our May/June Barcelona and cruise holiday- stylish runners,wedges and flat sandles- highly recommend these! Comfortable shoes that look good are a must – that’s why my suitcase always contains my fave FRANKiE4 shoes. I bow down at your awesome travel packing prowess Ruth! Last year we went had a week in Busselton WA followed by 3 days in Perth on the way home. It was February and it was just perfect weather. 5 things I am glad i packed………..bathers/beach towel/sunscreen/hat/comfy shoes. We are 75 days from a South Pacific cruise, so just starting to worry about what to pack. The trick being not to not overpack (which i ALWAYS do) but have just the right items.! The great thing about cruising Kerrie is that you don’t have to lug your suitcase around. Once it’s in your cabin, you unpack and enjoy. So don’t worry too much about the over packing but do work through my tips to ensure you’ve got all your options covered. I went to Sri Lanka for 3 weeks in January, weather was hot and fairly humid. I shared a suitcase with my husband so didn’t have a huge amount of space. Everything I took was either linen or cotton and all of it loose fitting – don’t need clingy in the heat! I took a squishable hat that could fold up and still retain its shape, two cotton wraps that were essential for temples etc but also great to throw over a sleeveless dress for sun protection, a stainless steel water bottle and I used Kathmandu packing cells to keep everything in its place – I hadn’t used these before but would recommend them as it’s so much easier to keep everything in order. For footwear I took thongs and two pairs of sandals but one would have been enough. 5. Swimwear and turkish towerl (which doubled as a sarong) – nothing like swimming at the goregous little beach around the headland for Positano and then popping the turkish towel around the waist to sit at the beachfront cafe for an Aperol Spritz and light lunch. Hoping to head to Cambodia this year so outfits will be slightly different for exploring ancient, spiritual sites and heat and humidity. We shall see how the packing goes! Love your essentials Leanne … and yes packing our Turkish towels was an inspired move for our Italy trip too! Cambodia sounds exciting!! 2. Spring, Winter and Summer. 3. No matter where I go I pack my own “Sydney Wrap” a pure Cashmere Wrap that so versatile for travel. 2 x Kaftan’s for Bali that I purchased on your recommendation a few years back, so easy and stylish for over there. 4. Another trip to Bali, this time for a month! A mixture of staying in villas, resorts & a road trip for 2 weeks. So would love to know a great combo to take so I still look great and feel comfortable while melting in the heat! A month in Bali sounds wonderful – I will put this idea on the list as I’m heading there again later in the year too. Thanks Nikki we are certainly looking forward to it! We were in theme park mecca Orlando, Florida plus a Caribbean Disney Cruise late last year. The weather was sunny and 30°c almost everyday, so the best things I packed were dresses and tees/skirts in lightweight fabrics with shoulder coverage since we were out in the sun most of the time walking around theme parks. Also saltwater sandals were brilliantly comfortable for all that hot weather walking. Plus I didn’t take a handbag! I took a backpack and a tiny crossbody bag. The backpack for the themeparks to carry water bottles, snacks, sunscreen, ponchos, as well as purse, phone, etc. The tiny bag was to carry my phone, the wave phone from the cabin (for when the kids were in kids club so we were contactable) and my room key while on the cruise. What to take? My biggest nightmare as I am an overpacker. A long cruise starting in heat, then cool, then maybe cold, then heat again….6 weeks! Hong Kong, China, South Korea, Japan, Alaska, Canada, Singapore. 6 formal nights. I never seem to take the right things and end up having to buy something in a rush enroute when I have a case full of unused clothing. Am unable to wear synthetics in heat or woollens in the cold. I keep getting told layers, but doesn’t that then mean a case full? Help!!! Hi Janice, you can do this! Trans-seasonal layers like above with some outer options if it gets really cold; and some summer options for the other extreme. Look for bamboo pieces and not all synthetics are the same. Mela Purdie’s technical fabric is breathable – see Johanne’s comment below about her packing for a trip last year. They also don’t take up space and are easily washed. We have just returned from 5 days on the Tweed Coast and my husband could not believe I was able to travel with just carry-on given my history of over packing.I actually only had 1 item I packed but did not wear- a t-shirt. Last year we had 5 weeks in August/September in Scandinavia, Amsterdam, Paris and the UK. The weather was unseasonally warm and dry for late summer/early spring and the layering tops (Mela Purdie mousseline cruise tops) I thought I’d be wearing over merino base layers, were perfect by themselves. I can’t recommend this fabric highly enough for travel given you can wash in the sink and dry overnight.Other MVPs were a MP trench in the same fabric that I wear with a slip as a dress; seamless tanks from Country Road that provide an extra light layer; CR jeggings; and most importantly for comfortable sightseeing my Frankie4 sneakers. The item I wore only twice was my (Sydney) winter weatherproof jacket, but having said that I’d pack it all over again- there’s no way I’d travel to these destinations without a warm jacket. The things I always struggle to downsize are my toiletries and makeup….but I’m getting better! I bow down at your carry-on travel wardrobe Johanne! Amazing. Thank sfofor sharing what worked for you on your trip last year too – very helpful. You know how much I love MP too! I love these sorts of posts ! Last year we did Bali, USA and Noosa – which was fabulous. I followed lots of your advice and overall did well for my packing. For our trip to the States I did overpack and as we are going back in July I will reduce my list by about a third I think. For the West coast this Summer my Summer dresses, Frankie 4 sandals and thongs and a few favorites from Blue illusion including my 3/4 stretchy pants and stretchy black jersey dress which can accessorised up or down. Having a fresh T to change into before getting off in LA and big sunnies was ideal. Love that you’ve brought some pink in there Cheryl! Great pointers for autumn in France Jan – go the FRANKiE4s. They’ve seriously helped me to cut back the number of shoes I pack and take with me. I’ll be going to Bali too – hosting a trip with Mrs Woog! I say yes to allowing space to buy while there. I’m so keen to go to Japan after my daughter returning and raving about it V! a great capsule wardrobe thankyou nikki! 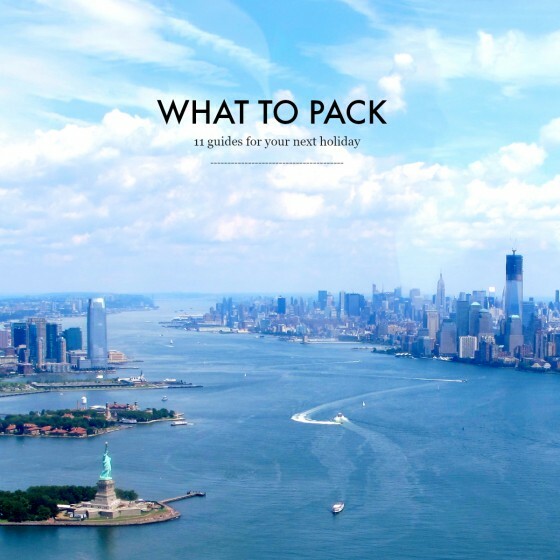 … always guided by you re organized packing tips! I know you are a reformed over packer! so trust there’s hope for me! very impressed by your overseas trip capsule! and ofcourse I lived that trip from my armchair! we went to Melbourne and qld last year and we went shopping!!! this year we are plan to stay in Sydney for a week then up to qld after that! I always love to layer with a shirt or jackets, scarf or wrap, they are staples as the weather is changeable! There is always hope M! And if you can go shopping and bring back extras, I say YES to that! In April/May we did Switzerland & U.K. then a Thailand stopover on the way home ! 4 weeks. 1.teva boots dark brown , flat and long with a zip that are designed for outdoor wear-waterproof ,good grip -but look like street wear boots not mountain hiking boots! 2. Black Ponte pants – so much more comfortable and versatile than blue jeans . 3. Black leather jacket( I agonised about whether to take a big coat or this jacket – would not have needed a big coat ) 4. Cream coloured long continuous loop scarf. 5.thin layers in neutral. This year it’s Central Europe with a choir on tour!! then Scotland highlands with a Hong Kong stopover on return. Sept/Oct. that will be a tricky one to pack for ! Oh and 6. Silver Frankie4s !! Love your essentials Bonnie … I think your Sept/October trip will be similar weather to April/May … you just might need to factor in some more warmth for the Highlands! What fun though!! I bow down at your packing genius Janice! And very sage advice about loving your coat and shoes as they’ll be in all the photos … and I could not travel without my FRANKiE4s now! 1. Thailand in February, UAE in May and onto Netherlands during June, North Queensland in October. 3. Bathers and kaftans for both beach holidays; dresses (mostly black) for UAE and Europe so I could add light layers if needed for warmth or cultural reasons, dress them up or down and you gotta love a 1 item outfit, blue illusion black skinny Benga jeans to travel in and a large black cashmere blend wrap. 4. Easter weekend away on the Victorian coast in jeans and light jumpers and Bali mid year back in bathers and kaftans. And always big glamorous sunnies! Big, glamorous sunnies are always a good idea Suzie! And what a wonderful travel year you had and have to look forward to. Oh I love this! Just what the suitcase doctor ordered! 1. We went on a road trip up the coast to Byron Bay. 2. Summer. 3. Shorts, T-shirts, thongs and some light summer dresses (I went shopping and added to my collection while I was there!) 4. We’re going on a run-cation to Disneyland, then onto Toronto, Vancouver, Seattle and San Fran and I can only have one case until the end of the trip. I need to know how to pack light and for different climates in one trip! Hi Sammie, I meant to do my “what to pack for the beach” post after Burleigh this summer but didn’t get around to it … might trot out for Easter but you’re right re shopping and adding to the collection. Re your run-cation, when are you going? You’ll need to allocate a bit of space to active wear yes? If not mid-summer then the above capsule would help get you started with other things. What an awesome trip! We have 3 runs in 3 days at Disneyland and it’s start of September so still sunny. Have 6 months to work on my capsule… And my running costumes!